OUR PRICE: $20.25 - Join Rewards Get $2 Dance Dollars On This Item! 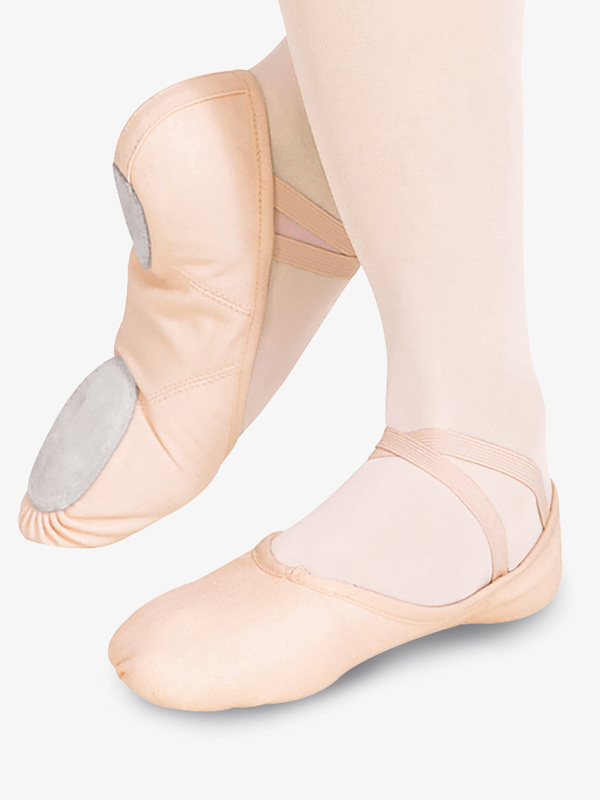 Capezio's canvas "Juliet" split-sole ballet shoe with drawstring, features a sculpted arch construction with no center seam, contoured suede sole patches, and a moisture-absorbent, antimicrobal brushed cotton sock lining. A pretty beginner shoe. I have Capezio Hanami's now and there is a huge difference. The Juliet's are quite bulky, and don't show off your arch as much. The drawstring is also a hassle and not comfortable. I was originally going to get the (Hanami) Capezio shoes but they were out of stock so I got these. These shoes are very good and they are very comfortable! I did have to re-sew the elastics because they put them way to far forward and it gave no support and looked ridiculous. But if you do not mind sewing then they are great! Also size up half a size I wear a 7 in street shoes and I ordered the size I had in my last pair of So Danca shoes which was 6.5 and I did not listen to the size chart and comments I could not even get them on so I sent them back and got a 7.5 and they fit perfectly so definitely size up at least half a size from your street shoe size! Runs a little tight around the metatarsals. If you have a high instep or higher profile foot so size up more than you might normally. (8 medium width in street shoes, I wear a 9M in this style) Good quality, would purchase again. To buy for the first time the size of the shoe was good. These shoes run very, very small. I would order 2 sizes up. I purchased this shoe and was very displeased to find that it had been pre-sewn. I do not like ballet shoes that aren't perfectly fit to my feet. I adjusted this by cutting the elastics and fixing them to my liking. The first time I wore them they were quite painfully tight that I had to switch shoes half way through class. However the second class, I decided to wear them again and they had become stretched to the right size and fit perfectly. They make my feet look beautiful and fit like a glove. Overall, I love the Juliet-style ballet shoes. They are a very pretty light pink, and the construction is great. As a first time dancewear purchaser, I have little knowledge of brands and products in the dance world (I was a gymnast for 8 1/2 years), and after completing quite a bit of research, made the decision to get these for my one day a week ballet class. I was careful to read the reviews before buying however, and am very glad I took the time to do so; if I had purchased even a half size smaller, the shoes would have been too small. Order at least a full size larger than your street shoe size, possibly even 1.5 sizes larger. DDS had the shipment out the next day, and it arrived smoothly in three days. My first impressions were great, and after dancing in these shoes for about eight hours in total, I can say that I am very happy with Capezio. Other than getting dirty easily and a small lump in the heel sole on one shoe (barely noticeable), I am loving these shoes. No middle seam, stretches comfortably, and the elastics come pre-sewn! Awesome for a beginning dancer! They hug your feet and enhance your arch shape, creating a great dancing experience. Would definitely recommend. These are really nice shoes but the sizing chart is completely off. Definitely order at least a full size larger than your street shoes. These shoes are pretty good. As other reviewers have said, the shoes run a bit small so I ordered mine .5 a size larger than normal (I am an 8 so I bought 8.5). I tried them on and were super comfy. During ballet class, my toes were being squished together and hopefully the shoes will stretch out and mold to my feet. I'm also going to say that when they arrived, some seams were already falling out. The color is a really light pink. I'll definitely order these again but next time I am getting size 8.5 wide. We have tried every slipper that DD sells, and a few others from stores. This one is my dd's favorite from all the 20+ so types that we've tried over the last 7 years. Holds up far better than Sansha's, doesn't have that painful seem on the heel cushion that Sansha's have, and just a great shoe all around. My 17 yo daughter (advanced in her expertise) recommended these. She loves how they snug her foot and arch and enhance technique. The fit true to size but are like a second skin. They stretch out ever so slightly, but if you do not like a snug snug snug fit, either order a wide or a .5 size up. But only because I am a beginner and think I need the extra room as I learn. Then I'm going back to my true shoe size. This shoe is extremely comfortable, but it runs a bit large. So, if you are an "almost 7", order a 6. However, if you are a true 7 or 7.25, order the 7. Theyre really comfortable and durable. The color is the same as most pink tights and it makes really pretty lines. These do come pre sewn so thats good. My street sice is usually a 7.5 and i ordered a 7.5M and it fit okay, it was a little tight around the toes but it will stretch and mold to your feet as you break them in. So I recomend ordering a half size up. I wear these shoes all the time to my ballet class! they run small. I usually wear a size seven so I got an eight and my toes are kinda crushed (I have REALLY high arches though)! I have small but medium/wide feet. I ordered suggested size according to chart but shoe was too small. I returned them for a refund. I ordered this item at 1/2 size larger than my street shoe size and it was significantly tight and crunched my toes. I feel I may need to order a full size up from street shoe size, instead of the recommended 1/2 size up. Other than that, the shoes seem to be decently constructed. Will be returning for larger size. Great for people with narrow feet! Finally found a pair of shoes that aren't bulky and bunch-y. I have very small and narrow feet, wear a size 4 street shoe, and size 2.5 is perfect. The inner lining is kind of unusual; it's velvety and got padding on the heel and ball, which is super comfortable (though gets worn away over time). My first pair lasted me about 1 year dancing on average twice a week, but my second pair got ripped apart really quickly. I blame switching to a new studio with hardwood floor and needing rosin; don't think this would happen on marley. There are many things I love about these shoes. For starters, they make your arch look AMAZING. I have a pretty low arch, and my previous ballet shoes were a little baggy, which just made it look like I wasn't pointing my foot at all. But then I got these, and suddenly, hello gorgeous feet! They're also very comfortable, and fit like a second skin. Plus, you can turn so well in them! I had been struggling for so long to get my double pirouette, and I was so close, but I just couldn't quite finish the second turn. But with these shoes, I can do a double easily, because there's less friction, and it just fits perfectly. These shoes would be perfect if not for one problem: they get holes very easily. I'd only worn them for a few classes when I noticed a rip on the bottom of my shoes, along the seam. I know other dancers at my studio have had the same problem. Overall, I would definitely recommend them, but keep in mind they don't last all that long. One tiny thing, though... why does discount dance have the wide version only available in size four? It really bugs me, because I wear a size 9.5 wide, and I have to get my shoes elsewhere. I have ballet class three times a week and these are so comfortable! These shoes last for a while, and the sponge in the area of the ball of the foot when you rise in releve is so comfortable! Runs a little large but gives your feet room to move and I highly recommend. Well I first ordered a size too big for my fit because I followed the street shoes size and compared to the actual dance shoe size and I got a size WAY TOO BIG! I was so angry so I exchanged for 2 sizes smaller and they were a little big, but I made them work, but what made me angry was I wasted lots of money on shipping so not worth it. But otherwise I do like the shoes they are comfortable, but the color is a little bit lighter than a normal ballet slipper. i love these shoes so much. they look really nice on my foot and fit well. however, i bought them in august and there was a huge hole forming under one of the soles by november. the durability isn't great, but everything else about this shoe i really like. I love these so much, they are really comfortable. I love how they're fuzzy inside. I've had them for a few months now and they fit just as well as they did when I first tried them on, they haven't stretched very much. I got a 1/2 size up from my regular street size. My daughter loves these slippers. They hold up well and are comfortable. I have these shoes and I love them! They are comfortable and look good. I've gotten other canvas shoes and they have been lumpy, but these fit perfectly! They last pretty good, but if you dance hard in them, the soles can come unstitched and you can get holes in the toes. Other than that, they are perfect! I really liked these shoes but if you have a narrow foot it doesn't look too nice. Also, the fabric is really thin but boy do they last! Overall I REALLY love this shoe! I have this shoe and absolutely love it! I have a pretty high arch and they compliment them very well. They are narrow, and that is amazing on my feet! I have a narrow/regular width foot with very tapered toes, and there was no extra room in the shoe. I have square feet, but not abnormally so, and these were WAY too narrow for me. They fit funny and I only wore them a few times. When a friend saw them, she said "oh if I'd have known you were getting those I'd have told you not to." They're soft on the inside, but what's the point if they don't fit my feet??? Yes! I luv canvas ballet slippers! I don't own this brand (I have another brand, called Russian pointe) but canvas works waaaay better than leather. With leather, you stick on the floor (but they're only good for recital at my studio). But with canvas, it makes you go faster with turns and spins and it helps you point better. These are a must buy if you are an intermediate or advanced dancer. Overall this shoe is OK. But when you're on demi pointe, the arch sags a lot. I'm going back to Sansha. I have only had one pair of Capezios before these and they were nice and comfy. I gave these a try: bad choice! Too narrow, creates an ugly pointe, and the sides slip down. The only nice thing about these are the soft inside. Get Sansha S1C instead! I am in an advanced ballet class, and I have used these for only about 2 weeks. They already have holes in the toes. They show my arch, but aren't very durable. Great for beginners, not for advanced dancers though! These are pretty good shoes. I usually go through them about every 2 months because they rip, but other than that, they are very comfortable. Everyone! This is a canvas shoe, they get holes! Just like all canvas, let's move on! They last me about 4 months, dancing two days a week. They have the softest inside of any shoe out there! It looks awesome pointed and the straps are already sewn on one side for you! These come in other colors but most places don't carry them. Anyway, these shoes rock. I buy them all the time! You can really feel the floor and I think they are the most comfortable for practice! I would definitely recommend to everyone. LOVE the split sole ! My daughter said it was SO much more comfortable dancing with the split sole! I love them, especially the foot pads in them to make your feet more comfortable. I don't know how I'd survive without them. I followed what the fitting chart recommended and that was way too small, but once I got my size, they have worked great! I LOVE THESE SHOES! They are so extremely comfortable and so soft, and I found it so easy to sew the elastics on these shoes. The only complaint I have is personal, and it is that if I had a blister on the sides of my feet, these shoes did rub and irritate the area. However, these shoes are extremely comfortable. I wear them in class, at play practice, and at competitions. I really recommend these shoes. LOVE the lining- so soft! And they look beautiful on the foot. But these shoes are too narrow for my feet, and I agree that they are squeaky when new. After wearing them for the first 10 min of class, I reached for my trusty old Sanshas. I love these shoes! I have been dancing for 8 years now and I love that there are no center seams. They allow for more defined arch while pointing the foot, and I don't feel like I'm wearing shoes at all. They also fit well into Converse when one has to go from Ballet to another class at college. I recommend these to all students! I dance everyday at my Junior high and they're great for this. They don't slip at all when I use them. They're great. I love these shoes because they are so comfortable. A lot of canvas shoes are kind of wide and I don't have wide feet, so these look great. They lasted almost a year for me, doing a class almost everyday. I guess it depends on how much you use them. I've used them for about three years now. I love them. I loved this shoe. The lining on the inside is very soft. They are also shaped to be very flattering to the foot. Thumbs up from me! I went through these canvas rather quickly. They don't hug the foot very well, so I switched to Bloch and I love them! I love this shoe because it makes my pointe look really good!! They are so comfortable. I've had them for about ten months now and they are still great!! These are very comfy, and look good. Soft fabric in the inside feels good. The only thing is that they didn't last long. Very comfy on your feet. The inside is almost like fleece. They do not last long at all but are very pretty and comfy. The turning sole is very small though. They are simply comfortable! The inner sole has cushion that makes you feel like you're wearing socks. I wear 7.5 in street shoes. What size should I get in these? We recommend Women order same to 1/2 size larger than street size. Please see out size chart on web page of item.This information is shown as a guide only and not a guarantee. Actual fitting may vary. Is sewing the elastics required with this shoe? Are the elastics presewn completely into the shoes or is sewing required? If your daughter wears a street size of 4 she is considered a 6 in adult size. The sizing is listed below based on the adult size 6. Suggested Fitting: Women order same to ? size larger than street size This information is shown as a guide only and not a guarantee. Actual fitting may vary. Do these fit the same as Capezio Pro Canvas shoes?